Still awaiting a replacement. It was supposed to be sent the first week of March, now it is March 15th. I do not like giving you one star but could not submit a review without selecting a rating. Everything I have ordered previously, has been perfect. Hello Jacqueline! We sincerely apologize that the frame was out of stock at the time when you placed the order. Due to the vendor extending the back order date, we were not able to immediately fill your order. As a courtesy, we contacted you to make sure you were ok with waiting on the order. We emailed you and left you a voicemail to make sure you are willing to wait on the merchandise. We understand this may present an inconvenience, therefore, we are pleased to help you find another frame choice. Please let us know what works best for you. Thank you for being a loyal customer. Happy Framing! A perfect frame for my artwork. Especially like the liner. Am delighted with every single frame that I have purchased!!!! The frame was well made, light weight and looks good. I was about to pay over twice as much at my local framer for a frame that wasn’t as nice and I would still be waiting for them to finish the job! This is an oil painting my mother, Teresa Webber, did of Happy Isles in Yosemite National Park. Handsome frame sets off my color photographs. A handsome frame with linen liner which I use with non-glare acrylic over color photographs so they almost look like paintings. I love the dark, rich, reddish color of the wood and the black accents. Good service good quality, every thing l expected. You will get more of my business. These are nice, but made in Mexico and should be 1/4 of the price you are charged. Hello Randy. Thank you for taking time to submit a review. These frames are indeed handmade in Mexico and exclusively sold only through Pictureframes.com. We often times offer promotional discounts to our valuable customers. Please sign up for our Emailing Promotional list so you can take advantage of the price breaks offered! If you have any additional questions, please let us know. Have a great day! These frames are high quality and a beautiful product to boot! We purchased the frames to house photos that we had of my husband and I when were children; over 60 yrs ago. They make an beautiful display as you enter our home. Painting I did looks great in this frame. Love the frame and my painting looks really good in it. Great frame for the price. Good quality and easily assembled. Used for photo and the frame sets it off nicely. 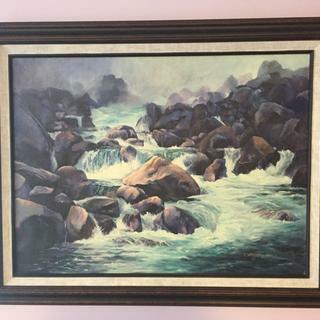 Wonderful frame for an unexpected low price. My frame is lovely and sturdy. I would have expected to have paid much more. I will definitely shop for my framing needs here again. I have bought this frame before and continue to be very pleased with its value for money. As always, Picture Frames is easy to deal with and very responsive to any questions or concerns I may have about their products. An excellent company to do business with. Great price and looks awesome. My favorite frame. Shipping was quick and good packaging. Will order more. nice product for a good price. will continue to purchase ready made frames in the coming months. Gorgeous frame...looks outstanding in a rustic setting! Would definitely purchase again! Nice frame, but it had scratches that I had to touch up with stain to avoid sending back. Nice frame when I was done. Hello John! We regret to hear this frame was not perfect. Please give us the opportunity to replace the frame free of charge by calling us when you notice any imperfections. We simply ask to see photos of the condition the frame arrived in. As a courtesy, we placed a company credit on your account. We apologize that you needed to touch up the frames. You can expect the next order to be perfect! Happy Framing! The frames look beautiful BUT when I screwed the provided fastener for the wire, the screw went right through the frame and pierced the front! I would give these a 5 star otherwise. Hello Lillian. Thank you for placing a new order with us! We are pleased to know that the frames look beautiful with your artwork. Our main goal is to provide you with the highest quality frames and printing. We apologize that you experienced the screw coming through the face of the frame. We can understand your concern and we want to make this right with you. 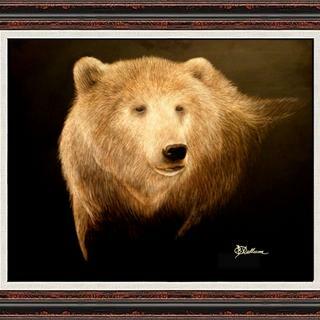 Please email us a photo of the frame to customercare@pictureframes.com. We would like to share the photos with our Production Team. Once we review the photos, we will come up with a viable solution. We look forward to hearing from you. Have a Frametastic day! This frame, 22x28 is a very poor fit, the dimentions are quite oversized. I had to center the art best I could and glue it into the frame. Not impressed. Hi Thomas. Thank you for your review. We never wish to leave our customers anything less than satisfied. We'd love to investigate the cause of this and provide the best solution possible for you. Our customer care team can be reached at 1-800-332-8884. We look forward to creating a better experience for you! I think this will look great with my fall painting in a marsh. Mahogany is very good wood. Black Shepard on varigated golden backround - should look good. Loved the warmth of the wood along with the linen to set off the painting. past customer, but not for the past 10 years. I am now getting back into the hobby of painting. I still believe that original oils need frames with liners. I call it elbow room because it throws all the attention to the painting and renders the frame as an enhancement; which it should be. 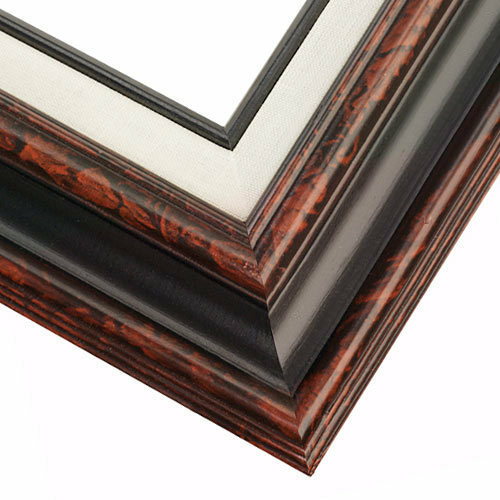 Its very difficult to find nice looking ready-made frames with liners now days. I ordered your Buried Mahogany because it looks professional with nice quality and its priced reasonably. This is my go-to frame. It seems to work with almost any painting. 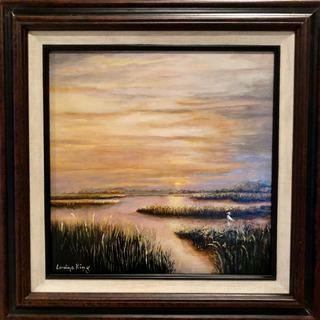 I chose this frame after looking at several others because I think that it best compliments the acrylic landscape painting that I plan to frame. In addition the price seems very reasonable. Style fits well withy my type of artwork and are always well made . Liner eliminates need for mat, colors work with wide range of photos, quality is very high. this frame is a good value for what it is. 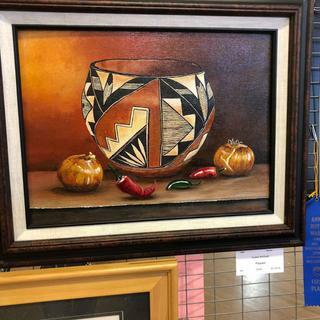 This frame added an elegant feel to the painting. I needed a custom size (18x24) and also like the inner frame border - eliminates the need to buy separate matting. Very nice frame. Goes with many of my paintings and canvas prints. Nice quality. The rich accents that embellish the frame, adds to it's distinctiveness, and will highlight the landscape picture that it will contain. Elegant and hopefully the light accent will help pick up the colors in the painting. I am an artist and this has been a very popular choice for my customers. I have a picture of Jesus that has browns, tans and black. I want to hang it dining room which is mahogany. Looks antique-y, for the old photo I'm using it for. 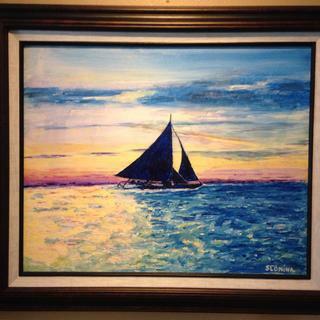 It's a classic frame with varied detail and color that nicely displays my painting. I framed one of my other painting with this frame and it looks fabulous. The linen insert shows any color in the painting highlighted and the Mahogany looks very professional. It makes any art work look great! Does the frame need to be assembled? BEST ANSWER: I purchased this frame a few months ago and it is shipped completely assembled. The only thing you need to do is add the hanging hardware which comes with the frame once your picture is installed securely. The entire thing can be ready in approximately 15 minutes. Ready to hang. This frame does not need to be assembled. This will arrive put together for you to simply insert your artwork. Please note, that you will need to order an acrylic and/or backing kit if needed. These items are not included with the frame. Thank you! No the frame is assembled, just need to put the hooks or whatever you choose to put in to hang it on the wall or wherever you display it. No, all frames excluding the metal ones have arrived fully assembled. No, it doesn't need to be assembled. It's ready to go. No assembly. It comes fully assembled. I have several diplomas, some from the U.S. and some from the U.K. They don’t quite measure out to 8x10 or 9x12. In each case, they’re about 3/8 inch short in every measure. Will your frames still work? This frame will work well for the size and type of items that you are looking to frame. The photos I used were quite o;d and not exactly the frame size however it worked great. This frames makes a classy piece displayed. I'm not sure about certificates. I purchased this for a large family photo. But with the built in border, it seems to me that you could make it work. Hi Hugh. We suggest ordering the exact size of your diplomas. This will ensure a better fit. Thank you! My picture is 10x12 , you don't have that size. Will the 9x12 show all of my photo or should I need to order the 12x12 ? I don't want any wasted space in the window but I also don't want to lose pay off my photo. Thank you for your inquiry. If your picture is 10x12 you should be ordering a 10x12 frame. If you order the 9x12 you will lose an inch of your picture. If you order the 12x12 you will have a 2" gap on along one side. You could consider getting the image matted and that would help with the gap if you order a larger size. We don't have a frame exactly like this one in a custom option, but you may like FRC13. This frame can be ordered in a custom size. You could also do a frame like EWA6 with the LNS2 liner. Give a call to our friendly framing experts and 1-800-332-8884 and they can work with you on trying to find a solution. First of all, it's an excellent frame. Now, if you are planning to frame a PHOTOGRAPH, it looks like the photo will have to be cut to fit the frame. Or, if you get the 12x12, you would have to have an extra mat cut to fit the 10x12 photo in the 12x12 frame...the other choice would be to have a special frame made to your dimensions. It sounds like with the 9x12, you would cut some of your piece out for the whole presentation. I would order larger and then add a mat sized to the photo and the frame. Possibly go 11x14 or 16x20 on the frame size. Get the 12x12 or larger and have a mat cut to fit. I have a 16x20 stretched canvas I need framed, 3/4 inch thick, NOT panel canvas which is flat and thin, will this frame work? BEST ANSWER: Hello! The frame will work with the canvas, but please consider the rabbet/depth of the frame is only 3/8" which will cause your canvas to protrude by 3/8". You will need canvas clips if you decide to purchase the frame. Thank you for your inquiry! "14 Burler Machagony" frame . What else do I need to make up for inside 3/8 depth? BEST ANSWER: Hello Vladimir! We suggest using foam core backing to fill in the space behind your artwork. If you are in need of additional from core, you will need to call us to order extra foam core. We can be reached at 1-800-332-8884. Happy Framing! My Paperboard print is 1.3mm will it fit in this frame? BEST ANSWER: Hello! Thank you for your inquiry. The depth of the frame is 3/8" which will support your 1.3mm paperboard. Please add the Acrylic front and foam core backing to the order if needed. Please reach out to us if you need more assistance. Happy Framing. I already have a mat for this piece. The dimensions on the mat are 12 x 16 with a 9 x 12 opening for the artwork. Will this frame accommodate? I have a streched canvas art that measures 16x24 and depht is 1.5 inches. Will this frame fit this picture? BEST ANSWER: This frame is only 3/8" deep and will not work with your canvas. Please look for frames with a rabbet depth of 1.5" or more.